This is the third part of the series on Azure storage. In this article, you’ll see how we can perform different operations on storage such as creating container, uploading blobs to the container, listing of blobs and deleting of blobs through the code. For this, you have to follow the prerequisites given below. 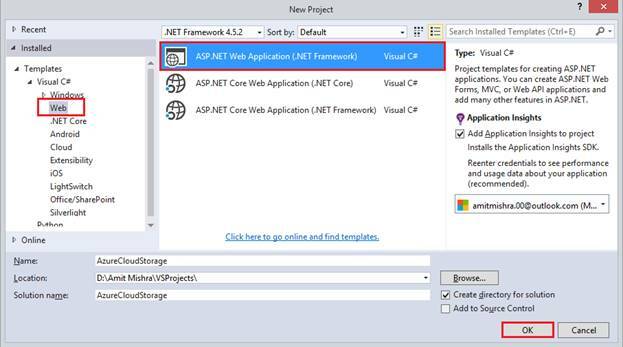 Microsoft Visual Studio 2015(.NET Framework 4.5.2). Hence, let’s start and follow the steps in the order to perform one of the best Azure storage, which is Blob Storage. I think there is no need to tell you, what Blob Storage in Azure is? If you want to learn and start with Azure, you can go with my series. In order to work, you’ve got to create a storage account by signing in to Azure Portal. After creating a storage account on Azure portal, open Visual Studio 2015 and create a new project. 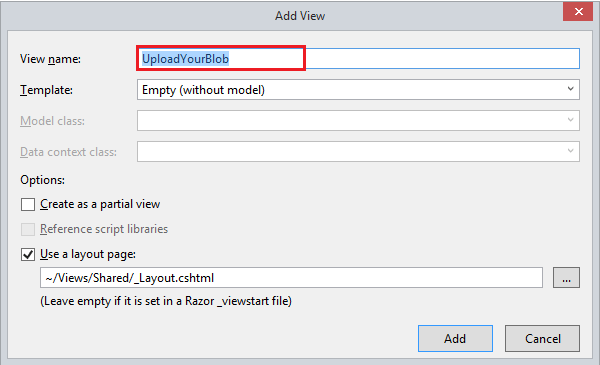 Select MVC template and click OK button. Here, my AzureCloudStorage project is ready for use. 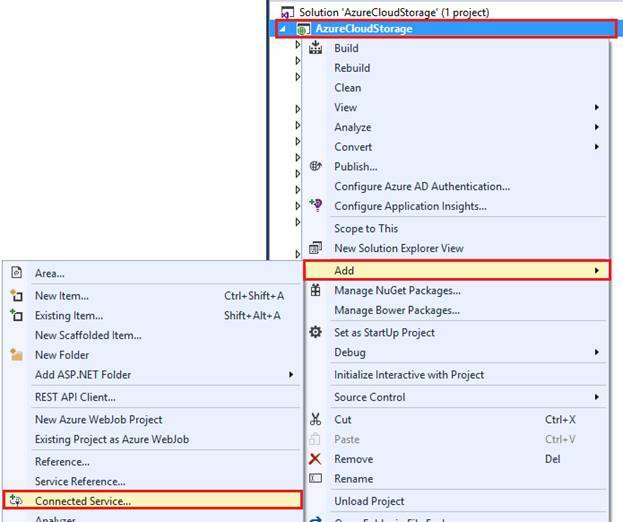 I need some references of Azure storage in my project and Azure storage account connection string. Right click on the project, add the Connected Service. We are going to work with Azure storage account, so select Azure storage and click Configure button to configure your account. This will ask you to enter your Azure credentials. After successful login, your storage account is automatically configured by it. If you don’t have any storage account, you can create a new storage account from the given option. All is set now. I have to write all the necessary code in my controller. To create a controller, right click on to Controller’s folder and add a controller. My Controller has been created. Here, add a method, which will return ActionResult. Under this method, create a Container for an existing storage account. Create an object of storage account, which represents our storage account information such as storage account name and key. The setting exists in Web Config file. To get all information, we parse a connection string from Cloud Configuration Manager. To create the Service client object, use CloudBlobClient credentials access to the blob Service. Now, create an object for CloudBlobContainer, which retrieves a reference to a container. Give a name to the container, which you want to create, unless a container already exists. I’ve used ViewBag to show, if container doesn’t exist, then show container is created, else it’s not created on view. Also, I’ve used ViewBag to show container name on view. Resolve to references and the main references are given below. Perhaps, you know that views are used to display the data. 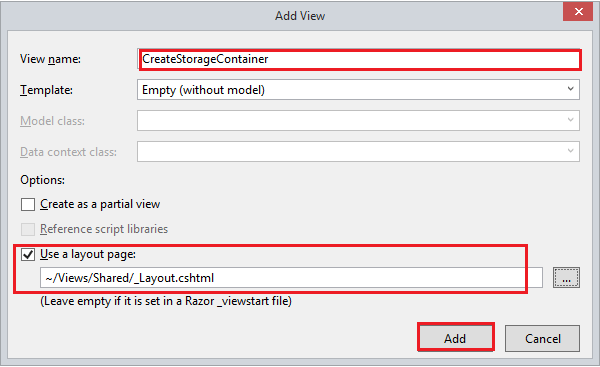 Let’s create a view for the CreateStorageContainer method by right clicking it. View Name would be as it is and use this view along with layout page. Here is the some code snippet on view to display a result on the browser that if container has uploaded, then show a message of success, else the same name container already exists. The screenshot given below is for CreateStorageContainer.chtml. Open _Layout.cshtml file and add an Action Link is required to create a storage account. Run the Application by CTRL+F5. The Action Link text is available, so just click on to it to create a Container in your Storage Account (mystoragecontainer001). 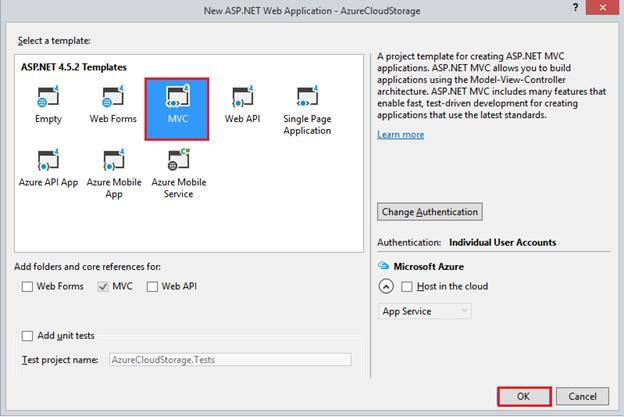 After clicking it, you’ll be redirected to your controller method and container should be created on Azure portal successfully. Let’s move to Azure portal and you will find Container has successfully been created under given storage account. Now, again go back to dashboard and click Action Link to check, whether it will upload same name Container or not. No, it shows Container already exists in your storage account. As explained earlier in the articles, Azure storage supports a different kind of blob types such as page blob, block blob and append blob. In this demo, I am going to explain only block blob. I need to upload a blob from my local file. Here, I am creating an object of CloudBlockBlob and retrieving a reference of block blob. From the myblob reference object’s UploadFromStream, you can upload your data stream and create a blob, if there any blob does not exist. Here, I’m using session, which would be accessed into another ActionResult through the string and string object would be accessed into our View to display blob name. Now, access previous sessions in string and ViewBag represents the string as its object and for container as well. //directory name from where you want to upload your blob. Right click near ActionResult method and add View for it. Create a view to display the data. Here, I am writing simple scripts in UploadYourBlob.chtml. Here, I want to show a simple demo. I want to show all the information on CreateStorageContainer.chstml view. Go to CreateStorageContainer.chstml and write some snippet, as shown below. The code snippet given above shows the result given below. If you click on blue text, it represents an action link. 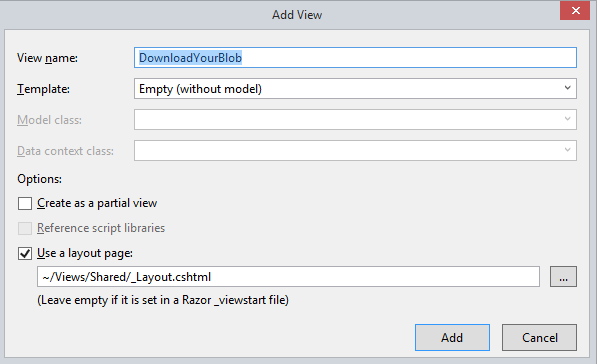 It will redirect to UploadYourBlob .cshtml view. If you try to upload it again into the portal, then it shows the blob named Lion3.jpg, which already exists, as shown. Here, I am creating a common function, which returns list of blobs in string, which can be used in different methods. For list, we’ll use CloudBlobContainer.ListBlobs method, which should return IListBlobItem, according to your object. Common function, which returns list of blobs as in string is CreateStorageContainer method. Now, right click on to ListingBlobs and add a view. In view, write the code snippet given below, as shown below. Open CreateStorageContianer.cshtml file and add get list from Model. Update your View from the code given below. Your Container has been created now ☺ You can Upload Blobs(photos, videos, music, blogs etc..)<br /> into your Container by clicking on it. Your Container already exist ☺ You can Upload Blobs(photos, videos, music, blogs etc..)<br /> into your Container by clicking on it. Run the Application. If there is any blob available in your container, then you can see the list of blobs. Add download and delete the link to the ListingBlobs.cshtml View. When you’ll click on file, the blob should be downloaded. Let’s write the code for Download blob and myBlob.DownloadToStream method transfers content of blob to the stream object. Give a path, where you want to download the blob. Add a view of the current method. In the DownloadYourBlob.chtml, write the snippets given below. Run your Application once again and click to download from the list of blobs. The blob should be downloaded. If you want to delete the blob,which you downloaded recently, you have to make another ActionResult for deleting blobs. Write the same code, find the object of CloudBlobClient and call its delete method. Add a view for this ActionResult and write the snippets given below. Click Delete the lion1.jpg blob. The downloaded blob has been deleted successfully. 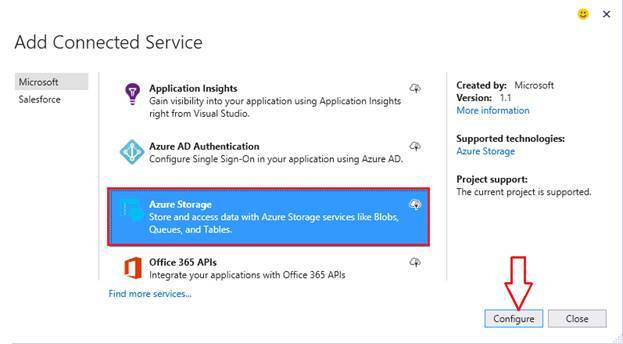 If you want to upload more containers and blobs into your Azure storage account, then you can only change the name of container and blob into the code.